It goes without saying that I love woodworking and spending time in the shop. But with a busy work schedule and an active family it’s not always easy to escape to the shop. Sometime I need a little push to get going (especially If I didn’t clean the shop last time!). Well Tom Iovino started Get Woodworking Week a while back to get us all motivated to get into the shop! I love my shop and the arsenal of tools I’ve been able to collect. I’ve been fortunate enough to be able to afford a wide variety of toys tools. It recently occurred to me while reading some forum post that not everyone who wants to “Get Woodworking” can. Perhaps you are in school, you’ve been laid off, or well, tools just aren’t in the budget. I’d like to help. My father recently gave me some tools out of his garage. There is circular saw, a jig saw, a hand sander, two drills and a hand saw. The sort of things you might pick up at a garage sale. These aren’t exactly Festool, but it will get you going. I’d like to offer these to an aspiring woodworker, free of charge, to pay it forward. Send me a note letting me know why you, or someone you know, could use some startup tools. I don’t really want this to be a contest, I just want the tools to get into the hands of someone who needs them and will use them. I’ll post your email here, but keep your last name between us. All I ask is that you eventually build something for someone (to pay it forward) and send me a picture. I will also throw in a $50 gift certificate to Woodcraft to sweeten the deal! I’ll cover the shipping, but I have to limit this to the folks in the US. I’ll choose someone Feb. 11th! What do you say? Send me a note below & Get Woodworking! 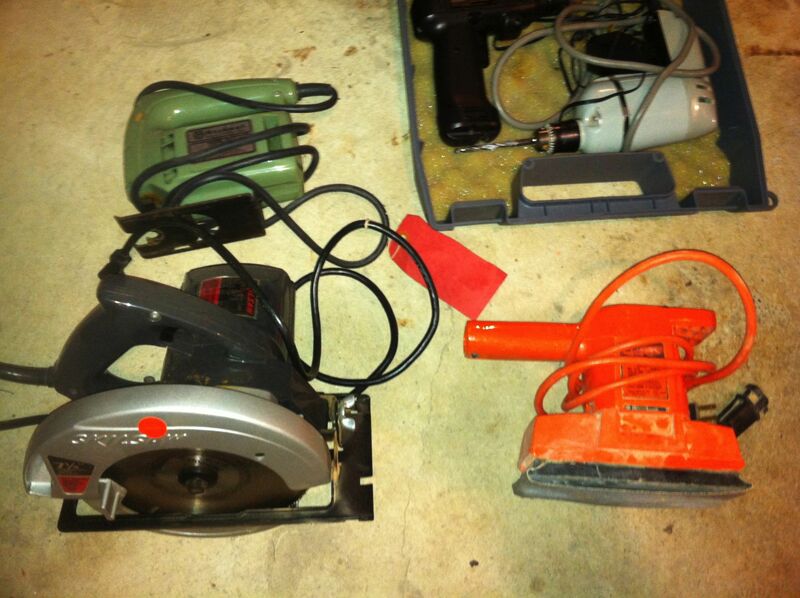 This entry was posted in Inspiration and tagged Get Woodworking Week, tools by Christopher Landy. Bookmark the permalink. What an awesome idea! I’ve got a couple of friends that I am going to point your way. This is a neat idea and really is a great way to help someone “Get Woodworking.” Going to subscribe with hopes of seeing the follow up. Thanks Chuck! I hope it can help someone out.